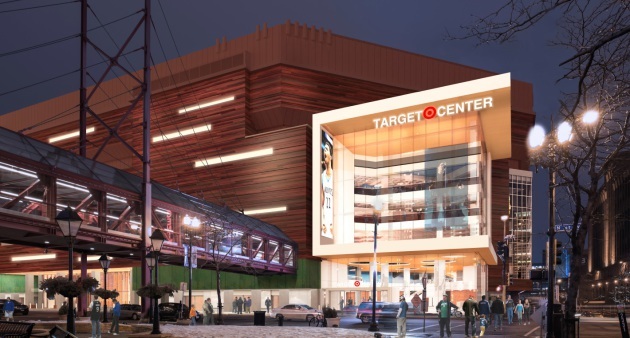 Growing publicity of the city's funding gap for roads and parks is creeping into the final debate over a $74 million city investment in Target Center, headed for City Council approval this week. The $129 million renovation of the building, about 38 percent of which will be paid by the Timberwolves, won approval from the city's ways and means committee Monday. The full council must concur this Friday. The renovation is almost certain to pass, since the facility is city-owned and most council members see an obligation therefore to maintain it -- a distinction from the more divisive Vikings stadium subsidy. The renovation will redo the exterior of the building, give it a glassy new entrance-way, add crucial loading dock space, reconfigure some interior fan areas, and add more premium amenities. About $102.8 million of the $128.9 million project cost, which rose last year, is for the construction itself. Two council members -- both of whom replaced supporters of the Vikings stadium -- objected to the deal during a short committee discussion, however. That follows similar concerns raised last week by an elected citizen member of the city's special tax board. "The issue I have with this is around spending in our city, and priorities and needs in general," said council member Andrew Johnson. "We have $30 million shortfall per year in basic road maintenance. I sure hope we support putting money into our roads that we need to. We have a $14 million shortfall in park maintenance." Johnson highlighted other shortfalls in firefighter and police staffing levels. Council Member Lisa Bender concurred. "I'm someone who believes that we should be investing in things that have a proven economic impact. Stadiums do not," Bender said. "So even though we own this one, I see no difference there." The council's vice president Elizabeth Glidden, a leader of the more body's more progressive wing, said she objects to the number of large event facilities in the Twin Cities. "As a community, we could have done a better job... to connect our plans for supporting so many facilities -- because it is the public that ends up paying for these facilities -- in a better way across the Twin Cities region." Glidden said Target Center is a different case, however, since the city already made the controversial decision in 1995 to own the facility. And with that came contractual and other responsibilities to keep it competitive. "I think [during] the last council, this was one of the items where almost to a person folks said that they wished that decision had not been made," Glidden said. "But we here are needing to make responsible decisions with the fact that today we own the Target Center." 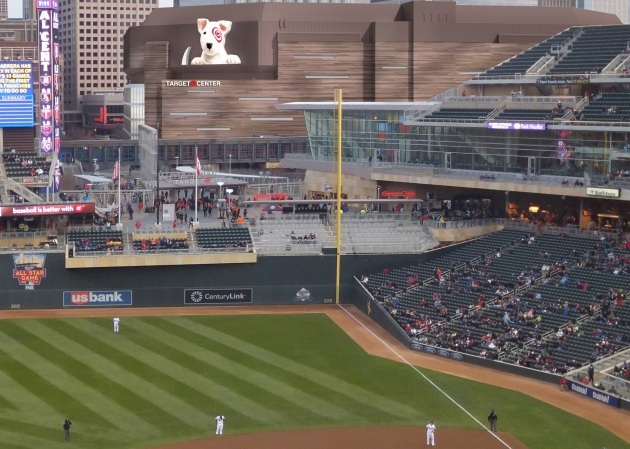 Above: Rendering of the proposed renovation, as seek from the stands at Target Field. Another council member who was not present, Cam Gordon, wrote in his monthly March newsletter that he opposes the deal because it violates a charter requirement to hold a referendum on city investments of more than $10 million in a professional sports facility. That referendum was also a major sticking point for opponents of the Vikings stadium. Similar grumbling over the renovation emerged during a meeting last week of the city's board of estimate and taxation, a body that approves levies and new debt. City staff explained at the meeting that financing the project will cost about $5.5 million a year. That will be paid by the suite of city sales taxes that fund the convention center and will also fund the Vikings stadium. They include a citywide sales tax, downtown liquor and restaurant taxes and a hotel tax. "We have to go to and ask the citizens to raise their taxes to pay for fixing the parks," said Carol Becker, an elected citizen member of the board. "And here you've been talking about a referendum to fix the roads. But there's no referendum for the rich guys. Rich guys don't have to go out and ask the citizens whether or not we should put $5.5 million in general revenues so they can have their stadium." Mayor Betsy Hodges responded she has historically opposed public funding for sports facilities. But a prior administration chose to purchase this facility, she said. "We own it. It is up to us to take care of it, it is up to us to maximize the benefits of it," Hodges said. "I have spent time at the Capitol seeing if we could get someone else to buy it. And we can't." To the renovation itself, she added: "This gives us a shot to make some investments that we will get something back from in the short term, the medium term and in the long term."